That DIY Christmas gift you made? Precious. That art project you did with your students? Fabulous. Those leftovers you brought in to lunch the other day? Delicious. That headband you’re wearing? Cute. Those invitations you sent out? Stylish. I love it all, and told you so, but here’s the thing, nothing annoys me more than when you reply with, “Thanks, I got it from Pinterest!” Stop it. Stop it right now. You didn’t get it from Pinterest. 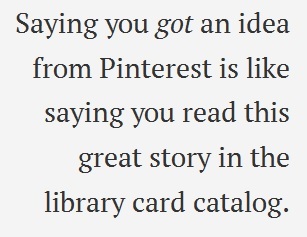 Saying you got an idea from Pinterest is like saying you read this great story in the library card catalog. You wouldn’t say that, right? No one would, because it isn’t true. The library card catalog just pointed you in the right direction so you could find the story. So why, why, why do you continue to tell people that you got it from Pinterest? Pinterest is merely a catalog that directs you towards primary sources. That cool lizard project you saw me make with my students? It came from Art. Paper. Scissors. Glue! who originally found it at The Paper Pear. That wreath I made for Halloween that you loved so much? It came from The Long Thread. Those awesome cinnamon bars that I brought in for the potluck? I got the recipe from Averie Cooks. And that, my friends, is how it’s done. “Oh, but it’s so much easier to just say I found it on Pinterest.” Yes, yes it is, and maybe, in everyday conversation, I can forgive you, but for the love of creativity, don’t ever, ever source Pinterest in a blog post. It infuriates me to see professional, creative writers and bloggers cite Pinterest as a source. Shame on you. You should know better. Give credit where credit is due and blah blah blah. You’ve all heard it before. Don’t make me say it again. And another thing, can we stop with the Pinterest Fail crap? Pinterest didn’t fail you, you failed. Just because you see something on Pinterest, doesn’t mean you can DIY it. Have you even read the blog you tried to replicate an idea from? These people are professionals. They do these things for a living. And even if they don’t, they at least have some experience and know what they’re doing. They are designers and crafters and artists. They have been doing this for years. Unless you already have crafting experience, don’t think that DIY Christmas ornament is going to come out right on the first try. Unless you have experience decorating cakes, don’t think you can replicate that Frozen birthday cake the morning of your daughter’s birthday party. Unless you have experience constructing furniture, don’t think you can make that awesome coffee table with the pipe legs on your own. So, in conclusion, knock it off. Pinterest doesn’t generate ideas. People do. If you haven’t heard, Art Teachers Hate Glitter has been nominated as Wild Card Blog of the Year over at The Art of Education. If you get a moment, it sure would mean a lot to my ego if you could hop on over there and vote for ATHG. Voting continues until Friday, January 23rd. Thank you. → It’s an art room. Get over it. Ooh… that would really burn my biscuits! Did the person reply to you? Are you kidding me? Hell no. Which is really rich, dontcha think? I have seen my lessons used from Pinterest with without even a mention of where it really came from. I love that people want to use my plans and ideas, that’s why I put them there but it’s frustrating when they do not give credit where credit is due. In my headlines directory it says “From Pinterest” but all the actual blog entries source the original. If I ever do a project, no matter where it comes from I give credit where credit is do. Even when I write an actual lesson plan I will source the original. I posted a photo that I had taken at the Hard Rock Hotel and Resort in Orlando ……taken @ the guitar fountain…..it came out lovely…..so I posted it on Pinterest……that was last year in March…….over 40 people have reposted my photo…..I was amazed……………. It is a matter of honour to research and credit the source of any idea.Don’t climb on others shoulders =stand on your own feet . as a blogger I really don’t love when people say they got it from pinterest… thanks for writing this… perfect!